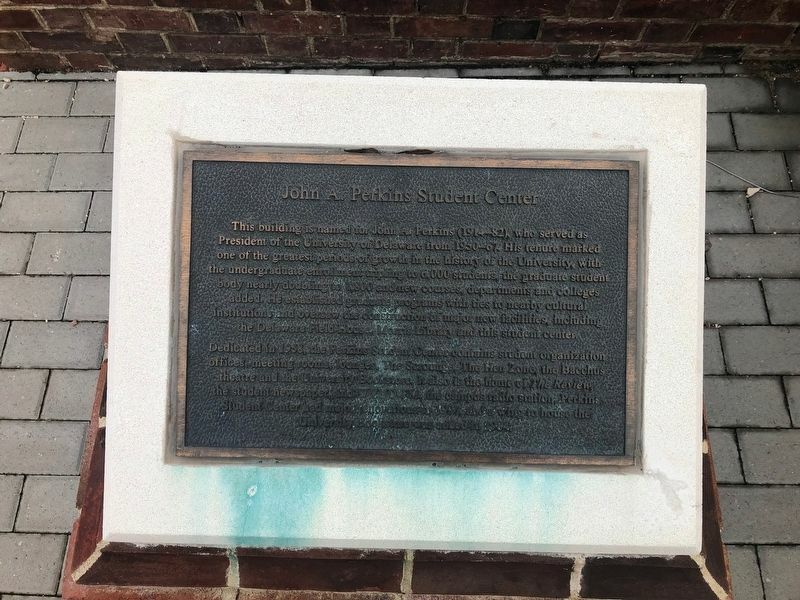 This building was named for John A. Perkins (1914-82), who served as President of the University of Delaware from 1950-67. His tenure marked one of the greatest periods of growth in the history of the University, with the undergraduate enrollment tripling to 6,000 students, the graduate student body doubled to 1,800 and new courses, departments and colleges added. He established graduate programs with ties to nearby cultural institutions and oversaw the construction of major new facilities, including the Delaware Field House, Morris Library and this student center. 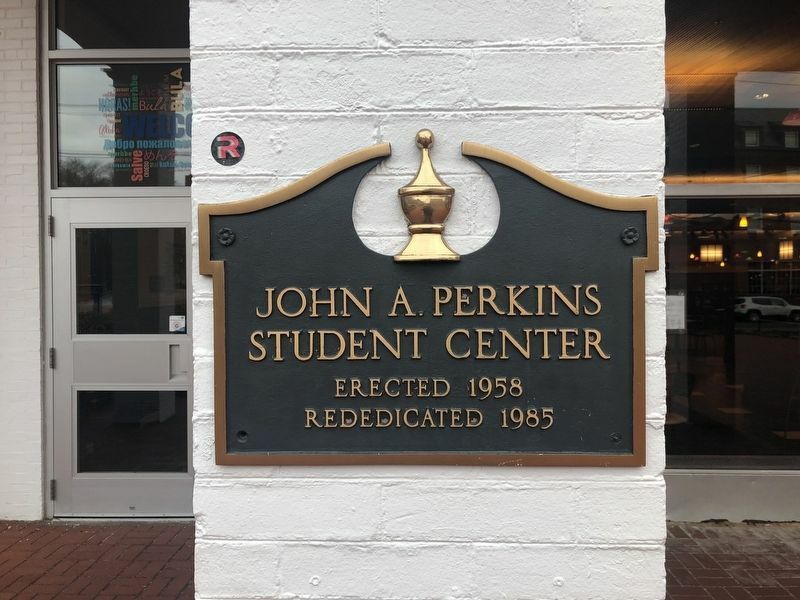 Dedicated in 1958, the Perkins Student Center contains student organization offices, meeting rooms, lounges, The Scrounge, The Hen Zone, the Bacchus theatre and the University Bookstore. It also is the home of The Review, the student newspaper and WVUD-FM the campus radio station. 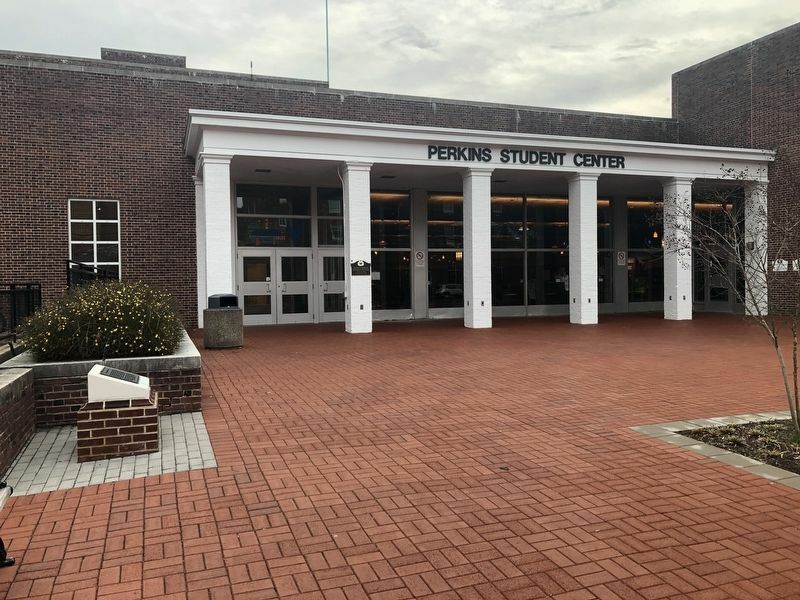 Perkins Student Center had major renovations in 1997, and a wing to house the University Bookstore was added in 1984.
. Marker is on Academy Street north of Courtney Street, on the right when traveling north. Touch for map. Marker is at or near this postal address: 325 Academy Street, Newark DE 19717, United States of America. Touch for directions. Other nearby markers. At least 8 other markers are within walking distance of this marker. Annie Jump Cannon (1863-1941) (about 500 feet away, measured in a direct line); New Castle Hall (about 600 feet away); Kent Hall (about 600 feet away); Rev. Dr. Francis Alison (1705-1779) (about 700 feet away); Sussex Hall (about 700 feet away); The Magnolia Circle (about 700 feet away); University of Delaware (about 700 feet away); Winifred J. Robinson (1867-1962) (about 700 feet away). Touch for a list and map of all markers in Newark. More. Search the internet for John A. Perkins Student Center. Credits. This page was last revised on March 15, 2019. This page originally submitted on March 15, 2019, by Devry Becker Jones of Washington, District of Columbia. This page has been viewed 27 times since then. Photos: 1, 2, 3. submitted on March 15, 2019, by Devry Becker Jones of Washington, District of Columbia.